Gender equality is a widely shared value in many western societies and yet, the mention of the term feminism frequently provokes unease, bewilderment or overt hostility. Repudiating Feminism sheds light on why this is the case. Grounded in rich empirical research and providing a timely contribution to debates on engagements with feminism, Repudiating Feminism explores how young German and British women think, talk and feel about feminism. 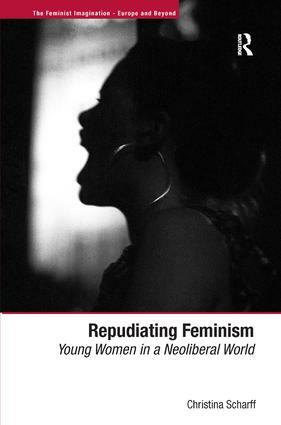 Drawing on in-depth interviews with women from different racial and class backgrounds, and with different sexual orientations, Repudiating Feminism reveals how young women's diverse positionings intersect with their views of feminism. This critical and reflexive analysis of the interplay between subjective accounts and broader cultural configurations shows how postfeminism, neoliberalism and heteronormativity mediate young women's negotiations of feminism, revealing the manner in which heterosexual norms structure engagements with feminism and its consequent association with man-hating and lesbian women. Speaking to a range of contemporary cultural trends, including the construction of essentialist notions of cultural difference and the neoliberal imperative to take responsibility for the management of one's own life, this book will be of interest to anyone studying sociology, gender and cultural studies.